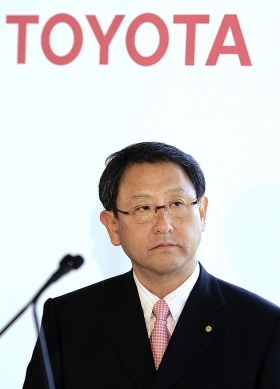 President Akio Toyoda said he feels "an extreme sense of crisis” because of the strengthening yen. TOKYO (Bloomberg) -- Toyota Motor Corp., the world's largest automaker, will likely revise its currency assumption for its full-year profit forecast to about 80 yen to the U.S. dollar from 90 yen, President Akio Toyoda said. “I feel an extreme sense of crisis” because of the strengthening currency, Toyoda told TV Tokyo in an interview late Tuesday. Even as the Toyota City-based carmaker boosts overseas auto assembly to reduce negative currency impact from exports, Toyota plans to maintain annual domestic production of about 3 million cars, he said. Toyota built 3.2 million cars in Japan last fiscal year out of 7.3 million units worldwide. The strengthening Japanese currency reduces the value of repatriated profits from exports. The yen, near a 15-year high, has gained 15 percent against the dollar and about 13 percent against the euro since the April 1 start of Toyota's fiscal year. The yen traded at 81.53 to the dollar on Oct. 26 in New York. Nissan Motor Co. Chief Operating Officer Toshiyuki Shiga said Tuesday that his carmaker probably also will revise its currency assumption for the second half of the fiscal year because the yen is stronger than an earlier estimate. The Yokohama-based company may also stop exports of some models from Japan and use more locally sourced parts at overseas plants to combat the strong yen, he said. Toyota will announce second-quarter earnings on Nov. 5. In August, the carmaker raised its net income forecast for the year ending in March to 340 billion yen ($4.18 billion) from an earlier estimate of 310 billion yen. Toyota fell 27 yen, or 0.9 percent, to 2866 yen in Tokyo Stock Exchange trading yesterday.